These tables are so lightweight that one person can easily carry them. Yet they handle an evenly distributed 2,000-lb. load. Top and bottom surfaces are made of super tough ABS plastic, which will not melt under temperatures up to 210 degrees. 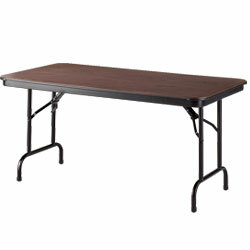 A honeycomb core provides strength and makes these tables lightweight. Top and bottom shells are ultrasonically welded around the perimeter to seal out moisture. Wide-mouth welds anchor the frame and leg tubing for extra strength. Feet are capped to protect the legs. 10 yr. warranty. SPECIFY TOP COLOR: GY - Gray, SD - Sand, WL - Walnut. GY - GRAY IS IN STOCK. Others FOB MISSISSIPPI. XK-2347GY 35	 Gray	 60" x 30"
XK-2347SD 35	 Sand	 60" x 30"
XK-2347WL 35	 Walnut	 60" x 30"
XK-2348GY 39	 Gray	 72" x 30"
XK-2348SD 39	 Sand	 72" x 30"
XK-2348WL 39	 Walnut	 72" x 30"
XK-2349GY 49	 Gray	 96" x 30"
XK-2349SD 49	 Sand	 96" x 30"
XK-2349WL 49	 Walnut	 96" x 30"
*SD - Sand is FACTORY QUICK SHIPFOB MISSISSIPPI. †Not available in WL - Walnut.